Cathy Porter’s very first professional gig was in 1989 at the Pub Flamingo in Halifax playing the Maritime Music Awards. On Saturday, the busy keyboardist and percussionist who has played with a who’s who of Maritime musicians, received the Musician’s Achievement Award, an honorary award from the East Coast Music Association, at the industry brunch at the Delta Halifax. ​“I’m proud to be the first woman to receive this award…I'll have to go home now and figure out how to make this into an instrument,” Porter said to laughter and applause as she accepted the silver, treble clef trophy. The Queen Elizabeth High School grad was playing piano at five, but is most drawn to percussion. ​“My thing is variety,” she said following the awards. 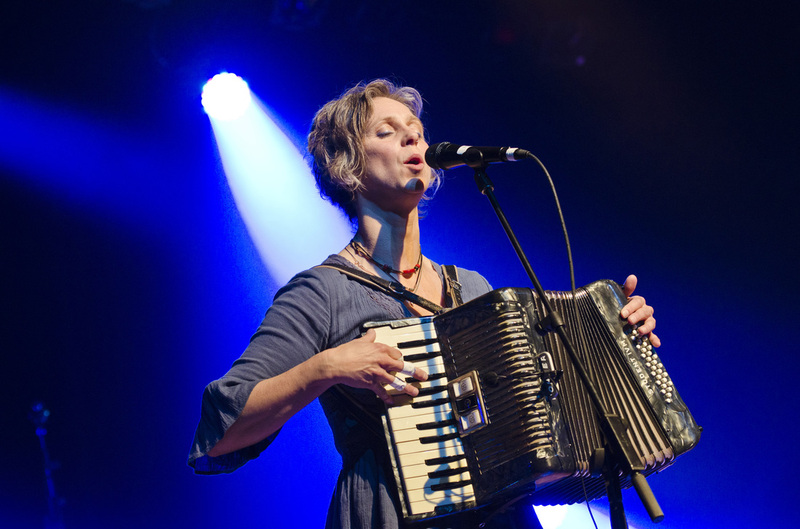 ​Porter has performed throughout the U.S., Canada, Western Europe and Brazil with artists including Mary Jane Lamond and Wendy MacIsaac, the Rankin Family, Dave Gunning, ​Natalie MacMaster, Amelia Curran, Meaghan Smith, Bruce Guthro, Lennie Gallant, Susan Crowe and Sons of Maxwell, among others. ​Cathy Porter has the perfect solution for stage fright: Get naked. When she climbed on stage for the first time in front of a crowd a dozen years ago at the legendary Club Flamingo, after a friend worked on her for two weeks to come and back her up at an Open Mike night, Porter ended up feeling euphoric. But she didn't start that way. "I was absolutely terrified of standing up in front of people," she said during a chat at Tribeca over green tea last week. "But I needed to do it. So I worked at the art college (now NSCAD University) as an art model for two-and-a-half years - I made good money." 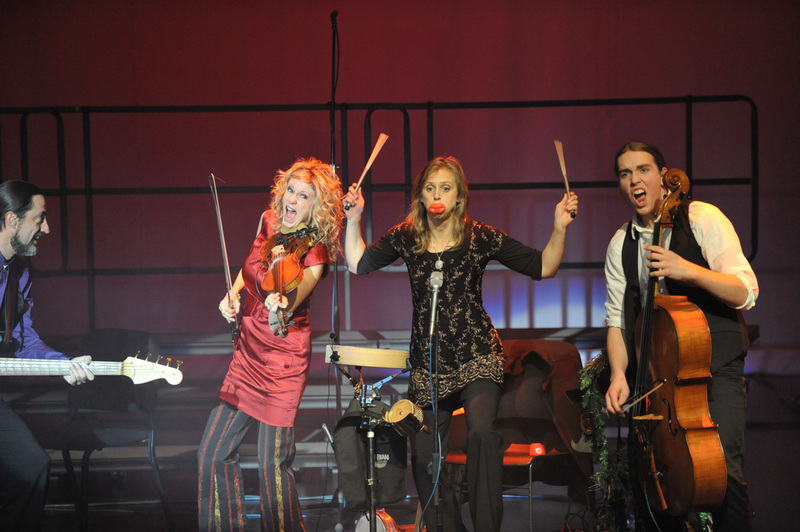 Porter is one of Halifax's busiest percussionists, pianists, accordionists and backup singers. Right now she's one of four percussionists who performed in DRUM!. She's also backed up innumerable folksingers and singer-songwriters including Rose Vaughan, Dave Carmichael and Mary Jane Lamond. Steep learning curves are a way of life for Porter, though her path to full-time freelancing (she's always on call) meandered at first. She studied English and Education at Mount Allison University. "I taught at Kennebecasis High School in Quispamsis, New Brunswick, as a long-term sub from the middle of September to Christmas, then went into social work for a year as a Case Aide for Nova Scotia Family and Children's Services," Porter said. In 1987 Porter rode away on a solo bicycle trip through Britain, a great idea for focusing the mind on the big picture. She discovered the principle that she has followed ever since: that she would only do what made her happy. So she became a musician. She bought a pair of bongos at Buckley's Music Center, then took a job as a driving instructor to tide her over the learning curve, though she already played piano and several other instruments. 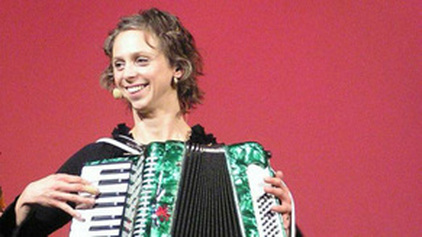 Porter owns her own set of percussion instruments and likes to specialize in the uncommon ones - like the washboard, which she also plays with a pickup and a wah-wah pedal. (continued from below...) As you may have guessed, Porter can't resist a challenge. In 1997 she was all set to go to Toronto for a Canadian Music Week gig with Dave Carmichael when Mary Jane Lamond came looking for her saying she needed a keyboard player for a week's worth of work. Her tour was starting in Toronto and overlapped the Carmichael gig. "Her previous keyboard player showed me what I had to do in an hour before leaving. He left me his keyboard and his sampler, but there was a lot to learn. I had yellow sticky notes all over the keyboard to remind me of the patches." Then there was the matter of the Gaelic phonetics she needed to know to sing backup for Lamond, who is Canada's best-known, if not the country's only, pop Gaelic singer. Porter went to sleep with earphones and Lamond's pronunciation tape set to play continuously. ​Porter prefers a natural sound to the synthetic sound of keyboard. She managed to talk Lamond into letting her play some of the keyboard cues on accordion. "Her first gig (on the tour) was in Massey Hall in Toronto......it was a defining moment, I knew I was up to the challenge." After the gig with Lamond, Porter began accepting every gig that came her way - folk gigs, some bar gigs, but mostly concert shows, working with bands like L'Ensemble a Part (medieval music) and pub band Blueberry Grunt. Every week is different, which suits her fine. "I'll play with one band and while travelling I'll have my Walkman on learning tunes for the next week. I don't panic as much now - I have the capacity to learn much faster." Yet it's not an easy life. Porter is driven by a desire for balance and reality. "Technology is taking us further and further from - let's call it the Life Force. I've always had a tenacious desire to be a better, a whole, a real person - to be who I am. Music is providing that. "Being in music business is heart-breaking at times, but I've never had a lack of work. The losing battle is with money. "But there is never a moment I'm on stage that I'm not grateful."